Are you planning on launching something? Things may sound complicated but it’s all about following simple and smart strategies. 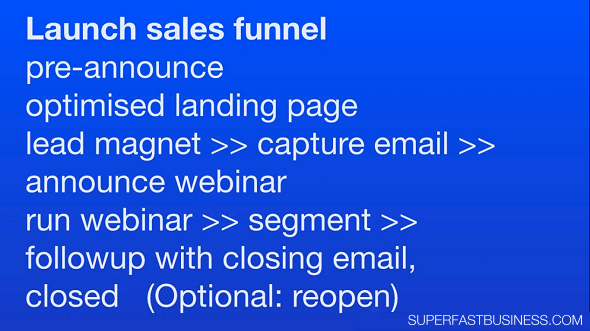 Here’s a simple sales funnel. 01:14 – Should you reopen? The highest converting webinar template. [Click To Tweet]. A simple launch funnel overview. [Click To Tweet]. Follow-up after a webinar. [Click To Tweet]. And you start pushing that urgency assuming that it’s something you’ll close. And then you close it. And optionally, you could reopen later ‘cause you had a few late inquiries or quite often in the Internet space, something broke or they pretend that it broke, which is a dastardly and a very disingenuous technique, so I wouldn’t recommend it. But if you’ve seen people do it, that’s what they’re doing for the most part. You could genuinely reopen. So for the longest time, SilverCircle was closed. And I only opened it every 3 months or so, when I was ready to take on another bunch of candidates. The only reason it’s open now is I’ve got capacity to deal with people who come. The investment has gone up so it’s really filtered out the member I want with price, and I’m getting super high quality candidates at a pace that I can handle. And also the group’s really stable ‘cause some of them have been around for 3 to 4 years now, so they don’t require much maintenance from me. They’re just really enjoying it. So I have small capacity ongoing, and I have intake that’s about right. I’m going to make decisions around that. But there is a launch sales funnel, you could screenshot that. And you’ve got something to start with. Don’t over complicate it; it’s not complicated.